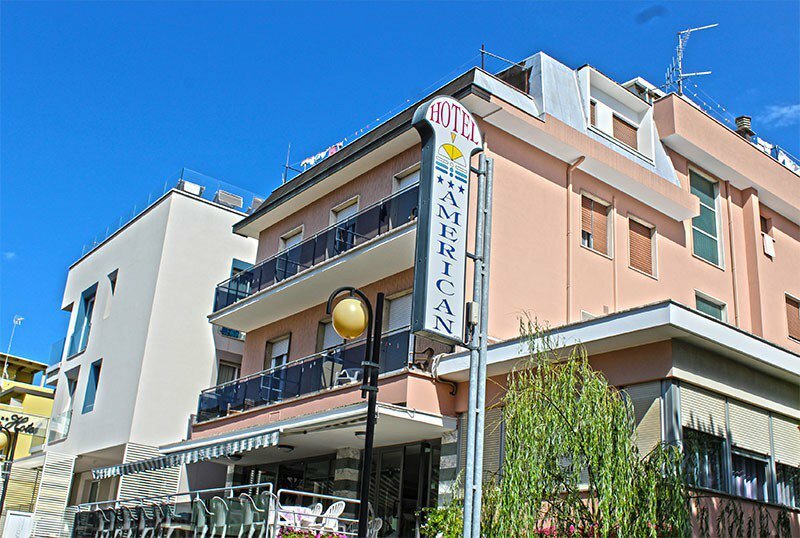 Hotel American is a 3-star family-run hotel in Bellaria. Well-kept and well located, it offers rooms with air conditioning, WI-FI connection and internal parking. Admits pets of all sizes. The property is located between the beach and the center of Bellaria, a few steps from the sea and just 3 minutes from the pedestrian boulevard Isola dei Platani. The rooms have a balcony, TV, direct dial telephone, safe, air conditioning, WI-FI connection, mini-bar, private bathroom with hairdryer and shower box. FAMILIES: solutions with multiple beds available. Furnished open-air porch, garden, sun terrace, bicycles available, living room with bar area, reading room and newspapers, elevator. The structure is equipped for cyclists and organizes theme nights. PARKING: covered and uncovered, both subject to availability and free. BREAKFAST: sweet and savory buffet with cakes, ring-shaped cake and homemade cakes, plum cakes, cereals, muesli, jams, honey, yogurt, cold cuts, fruit juices, tea, espresso and cappuccino. LUNCH AND DINNER: you can choose between menu with meat or fish and vegetables served buffet style. The desserts, egg pasta and piadina are prepared at home, according to traditional Romagna recipes. In the hotel: outdoor playground area, strollers, entertainment. Paid: baby sitter and pediatrician. In the room: cots, fall protection rails and bath tubs. At meals: high chairs, dedicated menus with pastries, vegetable soups, vegetable or meat broths, kitchenette available to mothers. On request it is possible to have meals with children at flexible times. The hotel has an agreement with the Paguro Beach from no. 39 to n. 41. At your disposal: wide spaces with games, entertainment for auditions and children with workshops and baby dance, beach volleyball courts, bocce courts, ping-pong, relaxation areas with newspapers, books, magazines and WI-FI connection. List prices are per person per day.